St. Moritz, the birthplace of Alpine winter tourism is a holiday resort town in Switzerland and seems like a well kept secret. It has hosted the Winter Olympics twice and guests from all over the world appreciate the modern Alpine lifestyle and winter sporting opportunities the area provides but you don’t hear much about this picturesque alpine town. It is a glamorous mountain resort synonymous with privilege and old money. These days it is a popular stop on the Bernina express – St. Moritz is a mid-way point on a train journey from Chur down to Tirano, considered one of the most scenic in the world. 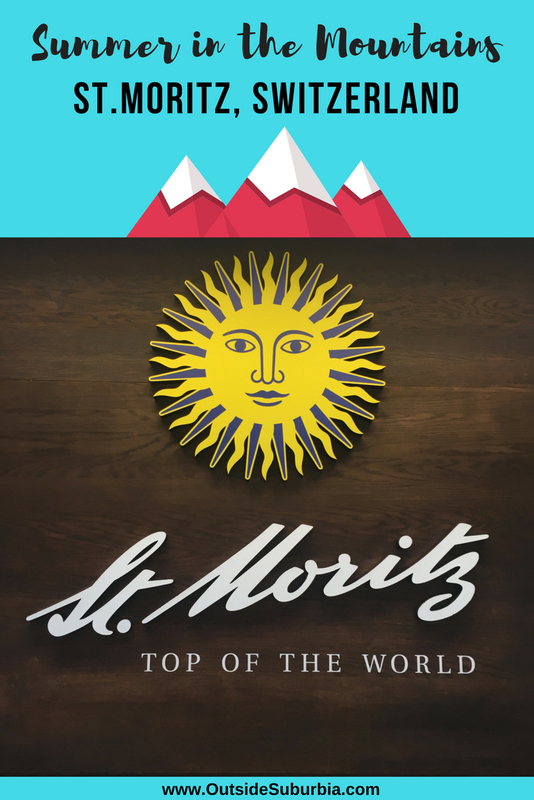 Saint Moritz first became famous thanks to its mineral springs. The springs were discovered 3,000 years ago and established the town as a summer spa resort early on. 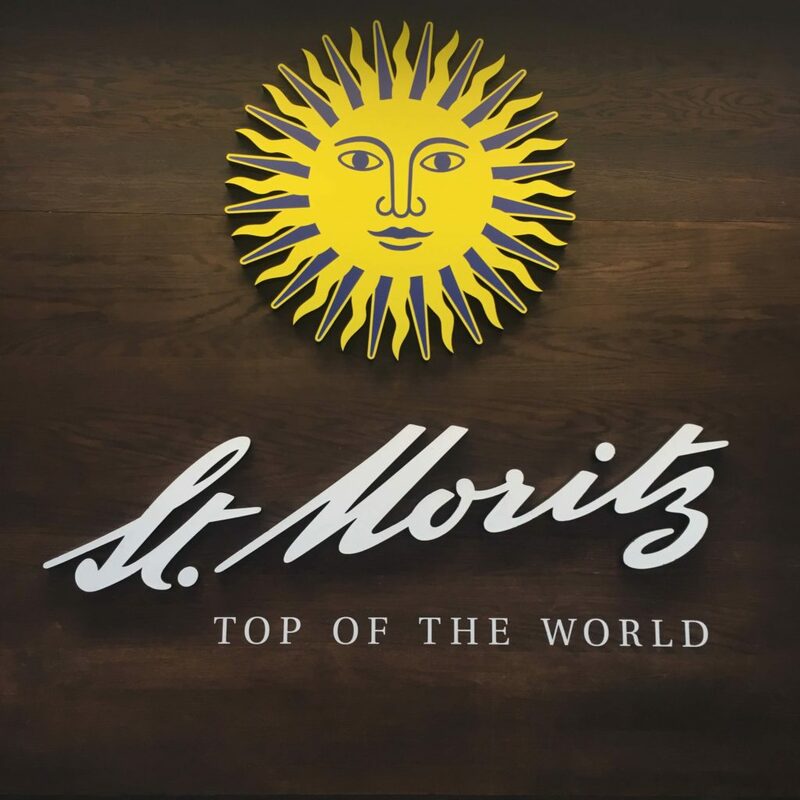 St. Moritz was always ahead of the times – the first electric light went on at Christmas time in 1878, the first golf tournament in the Alps took place here, in 1889 and one of the first ski lifts in Switzerland began running in 1935. We are loved spending a few days at Badrutts Palace Hotel in St.Moritz during our summer Alps road trip. 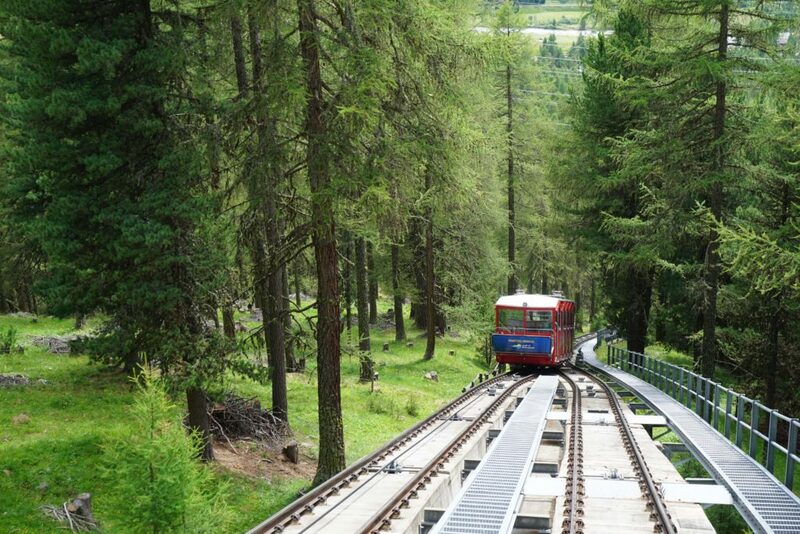 Here are some of our top favorite summer things to do in St. Moritz. 5.1 You might also like : Badrutts Palace Hotel : Vacation like Royalty in St. Moritz, posts from Switzerland and other places we have escaped to for a Summer in the Mountains! 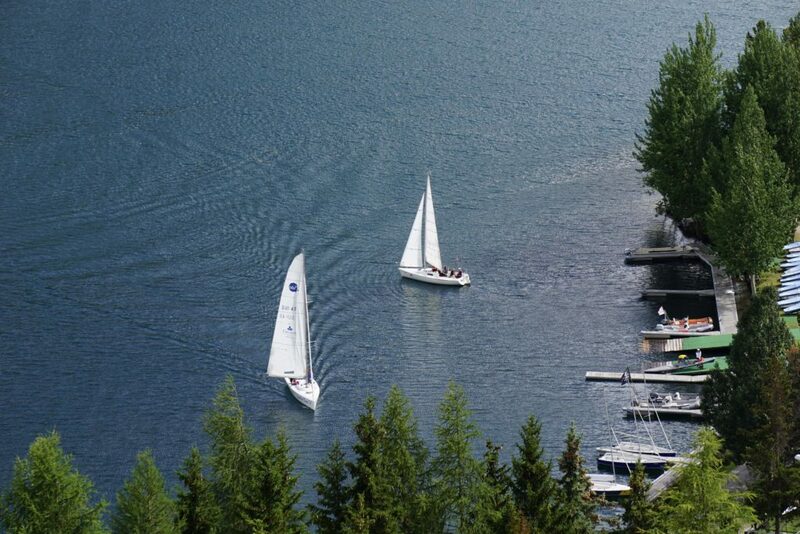 St Moritz has a bounty of summer attractions to keep you busy. Stroll the around the lake, get lost in the views of the snow-specked mountains that surround the town, listen to the cow bells as they graze on the meadows filled with wildflowers, enjoy lunch at the alpine huts in the mountains after lovely hikes. You are truly on top of the World here and life is beautiful. St. Moritz, located in the Upper Engadine, in the Swiss Alps at an elevation of 1,856 m, boasts plenty of sunny days. This sun is even depicted as the emblem of Skant Moritz. Enjoying the mountains is the best thing to do when you are here, even if you are not an avid hiker. Thanks to the exceptional mountain railway network, St. Moritz has easy access to many local peaks– you can reach Piz Nair, the Corvatsch, Diavolezza and Corviglia in a matter of minutes to take in some stunning views and start your hiking adventures. You can go on leisurely stroll along the trails if you are not up for hikes. Most resorts in the area include access to the mountains during your stay. 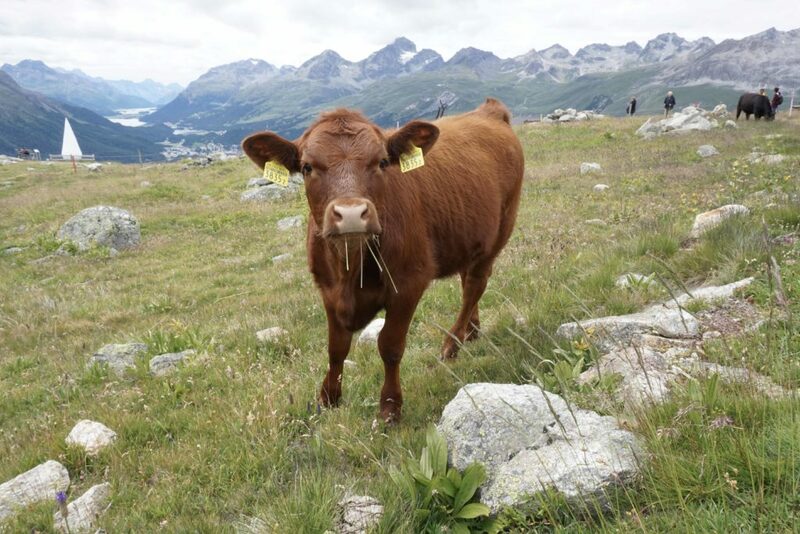 The hike in the Upper Engadin are challenging but never overly steep, this hikes offers stunning views of the Bernina Massif and you can admire the blue waters of tiny Alpine lakes, meadow with wildflowers and listen to the cowbells of happy Swiss cows grazing in the open fields. Corvatsch is the hiking mountain. 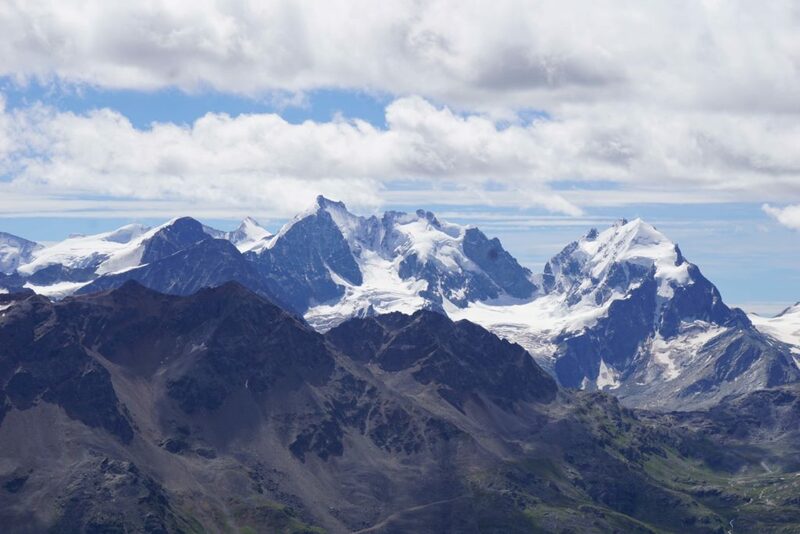 From the highest-lying summit station (3,303m/10,837ft) in the eastern Alps, hiking you can enjoy spectacular excursions down into the valley, via the Fuocla Surlej into the Val Roseg, from the Furtschellas into the enchanted Val Fex, or across the glacier to the Fuocla Surlej. Corviglia is the mountain biker’s mountain. St. Moritz’s local mountain with the Piz Nair (3057 m) is famous for perfect mountain bike trails, idyllic hiking trails, and unique restaurants. It is also possible to explore the Piz Nair without a guide, a unique experience at over 3000 m above sea level. At the upper station you’ll be just 30 meters shy of the summit and can enjoy lunch at the panoramic restaurant. 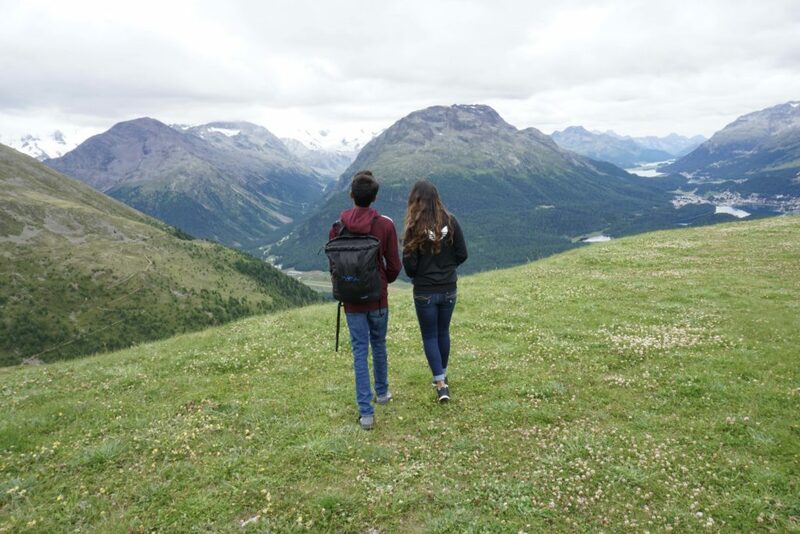 You’ll be treated to a 360° view of the Upper Engadin, and with the help of a map you can identify the lakes and mountains in the Bernina Range. Diavolezza is the touring mountain. 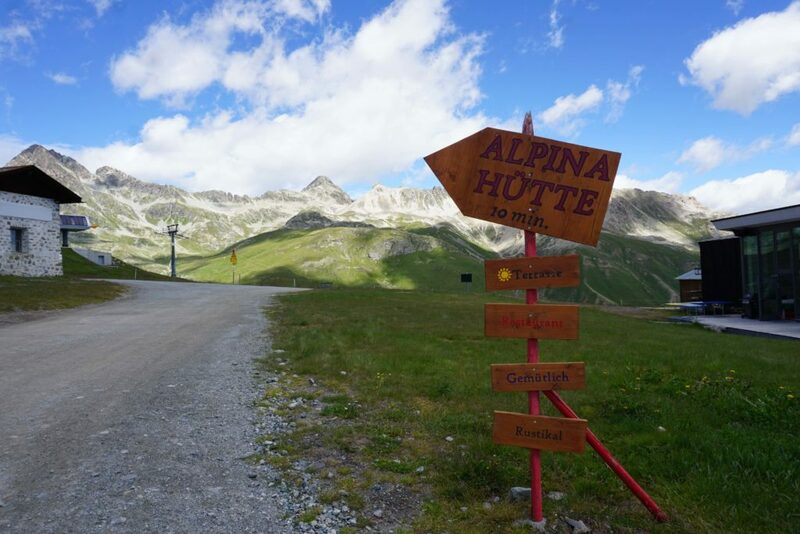 High-Alpine tours, glacier treks, the famous via ferrata offering two different routes and a fantastic view of the Bernina massif, and the highest-lying outdoor Jacuzzi in Europe (2,978m/9,770ft) all go to make this “devilish” mountain a real challenge for alpinists. Muottas Muragl is the panorama mountain. 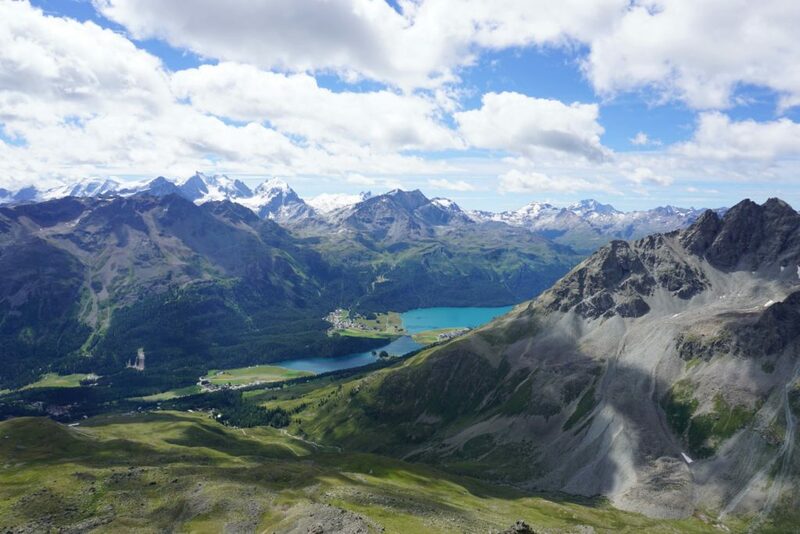 The most beautiful view of the Upper Engadin can be enjoyed from the Muottas Muragl, the wonderful hiking mountain. Mountain bikes are forbidden, you don’t have to share the leisurely paths with racing bikes. You can even stay on top of the mountains at Romantik Hotel Muottas Muragl and enjoy a spectacular sunset as the sun spreads its glittery carpet over the lake plateau. It can easily be reached in 10 minutes by funicular from Punt Muragl. We loved lunch here with views of the Alps, after our short hikes around the area. For the little hikers there are theme trails. The Schellenursli Trail in St. Moritz relates the famous story of the young Engadin boy of the same name on brightly painted boards. The Trais Fluors Flower Trail in Celerina tells the age-oldsaga of the flower fairy, Flurina. And the Fairy Trail in Bever has no fewer than six stories to discover, all of them written by local women and illustrated by sculptures. 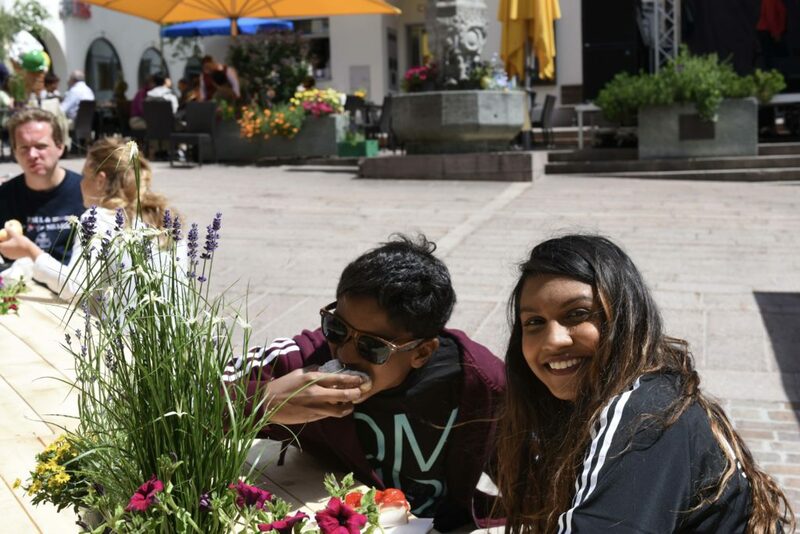 There are plenty of family friendly things to do in St Moritz in summer! Other leisure activities you can enjoy are romantic horse-drawn carriage ride around the lake. One the best free things to do in St. Moritz is to take a lovely walk around the shore of the lake. The trail is five kilometers or so, and takes between one and two hours. You can rent bikes to ride around the lake as well. You can hire a stand-up paddle-board or canoe and take a self-guided trip over the St. Mortiz lake. We saw quite a few sailboats on the lake. Nearby Lake Silvaplana is revered by windsurfers. On Lake Champfer, anglers fish in beautifully clear water, and Lake Sils is home to Europe’s highest-altitude scheduled boat service. Standing with a 5.5% tilt, which is more than the Leaning Tower of Pisa, the leaning tower of Saint Mortiz was originally part of the Church of St Mauritius which dates to the 1570s. The 33-metre-high Leaning Tower has been the town’s main identifier for centuries and worth a stop. In the 1890s the nave was demolished and in that same decade the bells in the tower were removed to help rectify the tilt. The late-19th century landscape painter Giovanni Segantini settled in St. Moritz and passed away here in 1899. In the previous 20 years he produced a massive volume of paintings of rural scenes around the Engadin. The Segantini Museum hold some of his most valued work, a triptych representing Life, Nature and Death in Alpine landscapes can also be found here. For winter sports enthusiasts there are 350 kilometers of pistes with a state-of-the-art infrastructure in the surrounding area. St. Moritz’s ‘house mountain’, the Corviglia, boasts the steepest start slope in Switzerland with the Piz Nair Wall’s 100 per cent vertiginous drop. Piz Nair is the tallest ski-able mountain in the region. Toboggan riders plunge down the icy run which is one of the oldest natural ice bob runs in the world. For winter hikers there are 150 km of winter walking trails and for cross-country skiers there is a track network of about 200 km. The snowboard fun park, curling and altitude training are just some of the other winter sports facilities. St. Moritz Polo World Cup on Snow – the prestigious winter polo tournament held in January on snow attracts around 15,000 spectators to Lake St. Moritz each year. We hope to make it there someday to enjoy winter on top of the world. 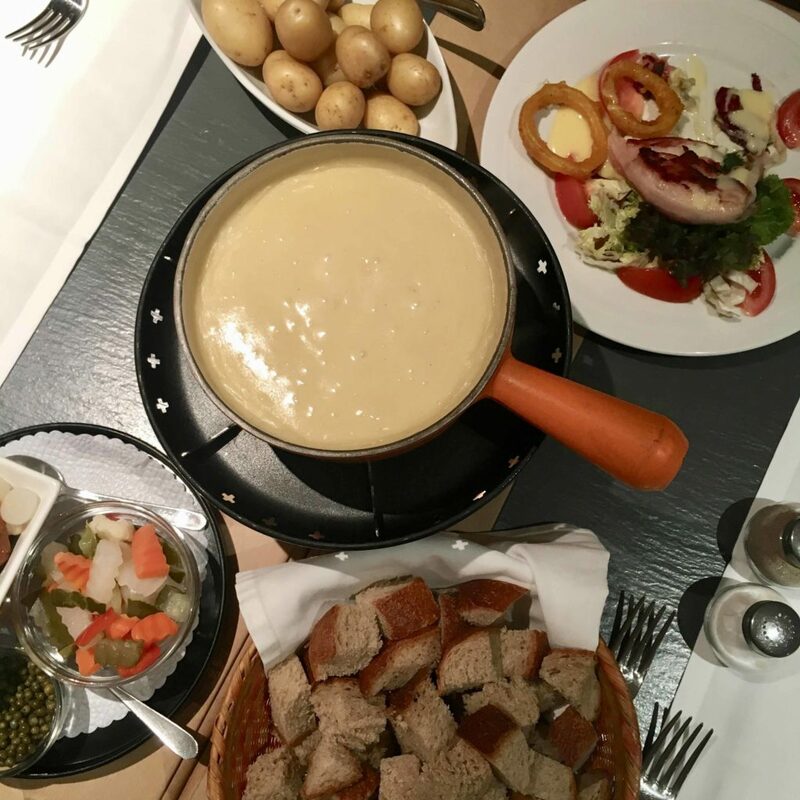 While you can get some amazing fondue and racklette when you are in St.Moritz, don’t miss the local specialties like the famous Engadine walnut nut tart. You can find it at any store in town. When in Switzerland, you just have to try all the local chocolatiers to sample all the Swiss chocolates you can. All the glorious shopping in Saint Mortiz are in La Via Serlas. It is the shortest and highest luxury shopping street of the world and offers an enormous range of high-profile brands like Gucci, Valentino and luxury watch brands that the Swiss are known for. St. Moritz is one of the most historic and glamorous holiday resorts in the world. Its name is protected as a trademark, and stands worldwide for style and elegance. It was the hotelier Johannes Badrutt who launched winter tourism here, with a daring bet. Johannes Badrutt took over the 12 bed Pension Faller in St. Moritz and upgraded it into a hotel with the name Engadiner Kulm (today’s Kulm Hotel). Caspar Badrutt (1848-1904), son of Johannes Badrutt, purchases the St. Moritz Hotel Beau Rivage, built in 1872 by C. Rungger. He charged the renowned Swiss architects Chiodera and Tschudi with the remodelling of the hotel. Johannes Badrutt won a wager and brought the first English tourists to St. Moritz for winter sports. He built curling rinks and the world’s first toboggan run and, in doing so, invented alpine winter tourism. 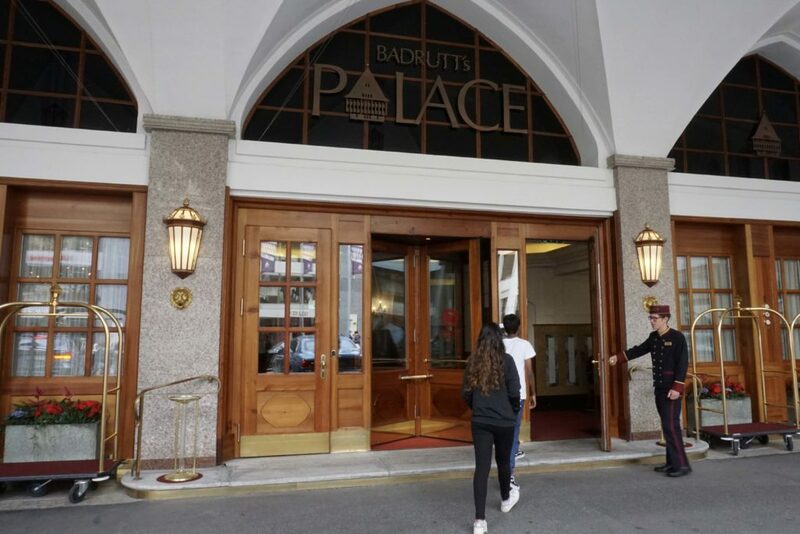 If you like to vacation like royalty in St. Moritz, Switzerland and relive some of this history Badrutt’s Palace Hotel is the place to be. While we are pretty partial to Badrutt’s Palace Hotel, you can see here for reviews of other hotels in the area. You might also like : Badrutts Palace Hotel : Vacation like Royalty in St. Moritz, posts from Switzerland and other places we have escaped to for a Summer in the Mountains! 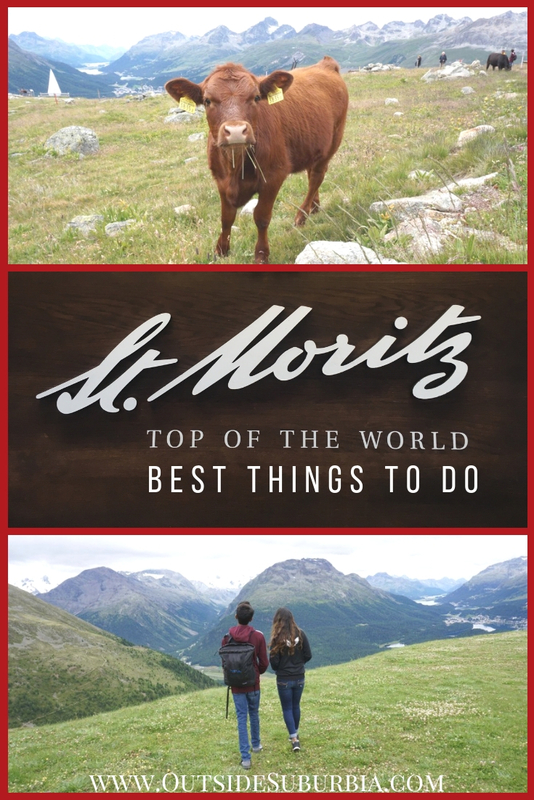 i didn’t make it to St. Moritz after three trips to Switzerland, but it certainly is on my list. I love Switzerland in every way and do remember hearing those cow bells in Weggis on Lake Lucerne.